A drug cartel claimed responsibility for an explosion that ripped through a passenger ferry last week in Playa del Carmen. 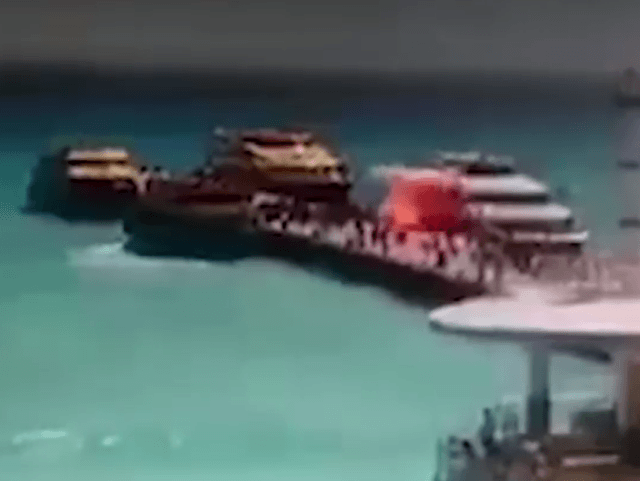 The explosion on the Barcos Caribe, which has been running a Playa del Carmen-Cozumel route since 2015, experienced a violent blast as passengers were disembarking. Currently, 25 were reported injured–including seven Americans. None were life threatening, as reported by local media. The responsibility for the blast was discovered during the early morning hours of February 27 when police in Cozumel received a call that three armed men were attaching an unknown object to a church fence. When police arrived, they discovered a narco-banner in the form of a tarp with a threatening message addressed to the mayor of Cozumel, Perla Tun Pech, claiming responsibility for the blast. The narco-banner was signed by the Cártel de “El Pumba” y “Tata” and warned the same will happen to the mayor’s home. Besides the signature of “El Pumba” y “Tata,” there was also a “Z,” indicating that the authors of the banner are aligned with Los Zetas drug cartel. Possession of the banner was assumed by the local police who transported it to the state attorney general’s office, according to a local report. Breitbart Texas has reported extensively on the ongoing cartel violence in the once tranquil tourist hotspots of Cancun and Playa del Carmen. According to authorities and Breitbart Texas law enforcement sources, deadly cartel violence has been attributed to the fight over the lucrative drug markets by CJNG, Los Zetas, Gulf, and independent groups loyal to the Sinaloa Cartel. Quintana Roo experienced a 118% increase in homicides in 2017. The fiery explosion of the Barcos Caribe, which was originally captured by surveillance video, was initially attributed to a possible mechanical failure. Barcos Caribe is associated with former Quintana Roo Governor Roberto Borge Angulo who, along with two business associates, acquired the ferry line while still in office. After leaving, Borge became a fugitive and was later captured in Panama attempting to board a flight to Paris. He is currently in custody facing corruption charges, according to the BBC.